Wellingborough Town’s impressive form under new boss Nathan Marsh continued as they sealed a fine 4-1 victory over Harborough Town at the Dog & Duck in the ChromaSport & Trophies United Counties League Premier Division. Deven Ellwood gave the Doughboys a half-time lead and Albert Akinremi put them 2-0 up before Ben Williams pulled one back. But Wellingborough wrapped up another three points thanks to further goals from Justin Dowling and Ellwood, who completed his brace. Rothwell Corinthians claimed a point as they drew 1-1 with Peterborough Northern Star at Sergeants Lawn. Arjun Hundal put Corinthians in front in the first half but the visitors secured a share of the spoils thanks to James Hill-Seekings’ effort after the break. 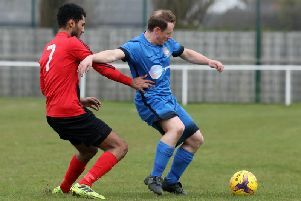 Two goals from Ryan Dove condemned Desborough Town to a 2-1 defeat as Cogenhoe United triumphed at the Waterworks Field. Dove put Cogenhoe 2-0 up before Jason Turner scored a penalty on the stroke of half-time for Ar Tarn who were unable to find an equaliser. Whitworth’s struggles at the wrong end of the table continued as Chris Hollist and Scott Coupland (2) gave Deeping Rangers a 3-0 home win. Raunds Town’s promotion hopes in Division One were hit as they suffered a 2-1 defeat at Olney Town. The Shopmates’ loss allowed Potton United and Blackstones, who were 2-1 winners at Irchester United, to close the gap to four points with Potton having two games in hand. Rushden & Higham United lost further ground, despite claiming a good point with a 0-0 draw at Lutterworth Town. The biggest win of the day came at Chancery Lane as Thrapston Town claimed an excellent 6-0 success over Huntingdon Town while Burton Park Wanderers produced one of the surprise results as they picked up an impressive 2-1 victory at Buckingham Town. There was more disappointment for rock-bottom Stewarts & Lloyds, however, as they went down 3-2 at Long Buckby.